Yeah, for instance, World of Tanks, with its massive playerbases on the Russian and European servers, might peak at a few thousand players for its test servers. Nobody tests test releases. Sad, but true for many projects. i mean he has valid points......and every time I went into the playtest, nobody was there. Not because he IP banned me (which didnt work) but because there was quite literally, nobody there. On the current non-playtest release, you'll find people. Just ignore that guy, hes still pissed at C&C games because he failed to sell cheats for money and deleted his youtube account. And funny how that guy dont get banned, he is just a example how retarded you can be, and you still are welcome in this community. His kid like behavior was noticeable on reborn, Ren X and other mods, even when he tried cowardly to change his name. Btw just leaving a link, not sure if he would be able to understand it but its worth a try. Only to show how worthless he is. Its not like you could play a game you actually like (which is definetly not OpenRA) and forget the rest. Or maybe if they listen to people complaining about their legitimately horrible networking and gamebreaking bugs more than 18 people would play their game. I actually liked OpenRA Tiberian Dawn when I was willing to open my ports and there were people still playing it (which was still not enough) but since no one plays it probably because of network issues other people also have with the game among other things the game is now unplayable. How about rather than defending the broken game you accept other people's opinions about why they aren't playing it. On a side note not sure why you would put your mod on such a unfinished game engine full of bugs when you can get better results and a larger community with legit Tiberian Sun. Can we please ban this shortbus clown? Nothing useful ever came from this troll and every topic is quickly derailing when he appears. Yes please ban me for showing that their game is so poorly made that it doesn't work on my setup. Also, when you build something on the build bar many times it will build the same thing twice with a single click. Strange game. In fact my post showing their game still has network problems is probably the only useful post here. All other replies are wild accusations of something that isn't true or derailing posts like your own. Dont try to lie to a dev in his face please, the filter isnt configured like that by default. Didn't change anything. It's your job as a dev to fix it if you don't like what you see. But judging by his incompetence to know what the problem is without assuming I changed a filter shows he's not gonna be able to fix it. Pick the quiet time of the day and then change the "Filter Game" options to hide the active games (revealed by the mismatch between "18 Players online" and the game list). 7/10 troll attempt - this one was kind of clever. I didn't "pick the time" I installed it and logged in. I didn't change the filter. Rating your own troll attempt at least. Maybe they are on the old version or idling like I was not in a game room? Either way its a ghost town. Every single dead game has "quiet time" excuses. This update is really popular. You can always find a match at any time. OpenRA is really going places. This announcement is a reduced version of this news post from OpenRA Website and this copy at the PPM Forums. I've removed the mentions to Shattered Paradise and the interview, because they'll get other news posts for themselves. Hot off the presses, we are pleased to announce a new OpenRA playtest series. With your help, we hope to find and squash any lurking issues and produce a refined release version in a couple of months time. Anonymous players continue to be identified by their IP and geo-location. Players can add badges to their profile to show their favourite mod, OS, or community achievements. A selection of default badges are available for selection in your forum User Control Panel, and we will individually award badges to players who have contributed to OpenRA’s development or participated in special community events. We hope to extend the profile system in the future to add more features and improve security. 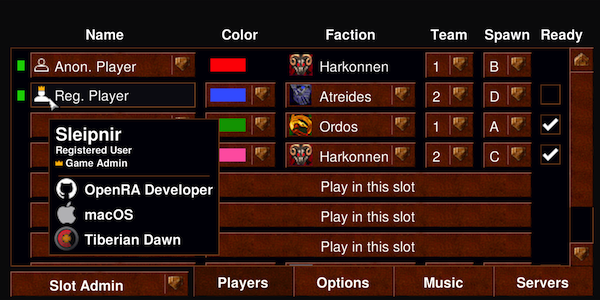 Other improvements to the lobby UI include an improved color chooser, the ability to select in text-fields using the mouse, and the game returning to the skirmish/mission/multiplayer panels instead of the main menu after leaving a game. Chronoshifting MCVs opens strategic options, but beware the chrono-vortex if you cause a paradox! Significant work has occurred behind the scenes to fix crashes, improve performance, and extend capabilities for our modding community. Our recent news post discussed these topics in much more detail. We encourage modders to view the SDK release notes and update instructions for instructions on how to take advantage of these improvements. This playtest also marks the shift to AppImage releases for our Linux builds. We have also repackaged the last release version as an AppImage, and will update this alongside future playtests if any packaging bugs are found. As always, we suggest you read the full changelog for details on all of the changes included in the playtest. We make these playtests available to get feedback from the community about the future direction of OpenRA, and we value your feedback on our forum our GitHub issue tracker, or in the comments below. Playtest releases do not overwrite the OpenRA release version, and you can automatically switch between the two versions when joining a multiplayer server. 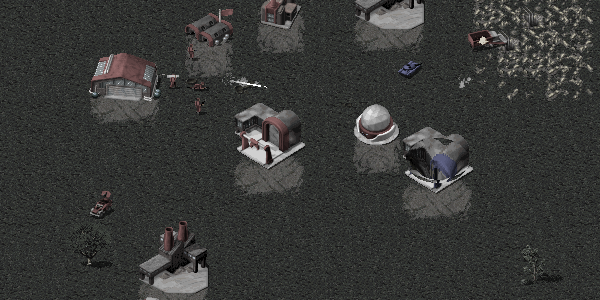 Head over to OpenRA's download page and give it a try!